JEGS Exhaust Turndowns are mandrel bent aluminized or 409 stainless steel. 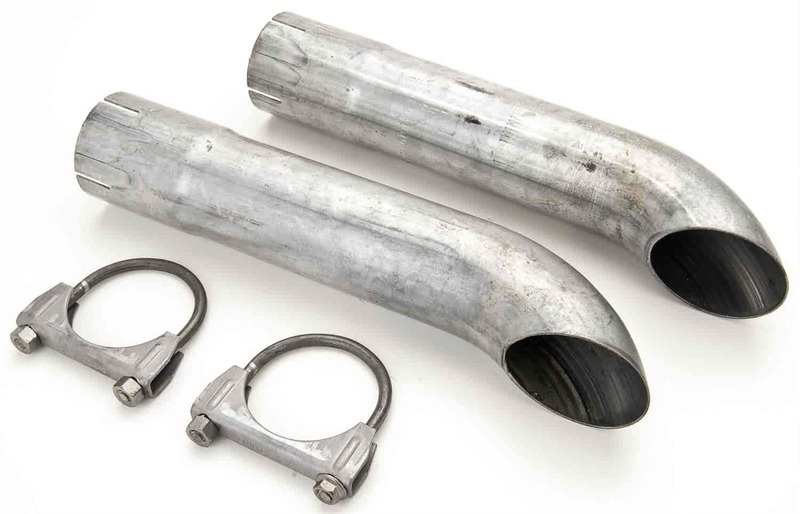 A popular exhaust option for high performance applications, used to redirect exhaust flow exiting the muffler. Inner diameters range from 2.5" to 4" with a length of 13.5". Clamp included for each turndown. Sold individually or in pairs. 30641 is rated 4.9 out of 5 by 7. Rated 5 out of 5 by cudaman70 from Awesome part.worked great.Fit perfectly.Looked just like i want . Rated 5 out of 5 by S10Blazer from Great parts I bought these to do a quick finish to my side dumps. Not only did they look awesome but fit perfect and I got the clamps with them and didn't even realize I had them until I needed them! Great job!! Rated 5 out of 5 by Bigmike21 from 2.5" turndowns 2.5" turndowns worked great, exactly as described. I wish they came with some jegs stickers a hat like the old days! Rated 4 out of 5 by Ahab from As pictured parts Have not installed yet, but no surprises from delivery. You get exactly what you pay for.